Today the below message ran in the Independent Review – the local paper in our hometown, Litchfield, MN. Finally, after another long Minnesota winter, spring is just around the corner. This week, bunnies, baskets and eggs are top of mind as families prepare for Easter. Eggs are always on our mind at Sparboe Farms! At Easter, when many families are purchasing eggs for Easter activities, we make sure there are plenty of farm fresh eggs for our customers to color and enjoy. Our hens and employees work hard to keep eggs on grocery store shelves all across the Midwest and we appreciate our loyal customers who choose to buy local eggs from Sparboe Farms. Sparboe Farms was founded in 1954, and like Litchfield, we have changed and grown over six decades. We support local businesses and employ over 100 people in central Minnesota. We strive to be a good neighbor through responsible farming practices and environmental stewardship. Over the years, we have contributed to the Litchfield community in many ways. We have also donated millions of eggs to food shelves throughout Minnesota, Iowa and Colorado through our monthly pallet donations. Organizations like Feeding America constantly seek egg donations since eggs are a wonderful, low cost source of protein. Farmers today (including those farmers in the Litchfield community) are producing more quality food, using fewer resources than ever before. For example, in one year, the Prairie Farm in Litchfield produced enough eggs to feed nearly 1.5 million people in Minnesota. The manure from our farms is used as fertilizer for local crops, and in turn, we buy our chicken feed from a local mill. Our commitment to Litchfield is clear as we reinvest in our Prairie Farm on east U.S. Highway 12, which was originally constructed 40 years ago. This multi-year, multi-million dollar project began in 2011 with the construction of a water treatment plant that treats wash water from our farm and our reinvestment does not end there. You may have noticed that some of the original barns have been demolished. This is to make room for the first new barn, which will be one of the most modern hen housing systems in Minnesota. The new farm will have improved work spaces for our employees and enhanced housing for our hens. The renovations are being designed with best in class plans for food safety, the environment, and energy efficiency. We are very excited about these big changes at the Prairie Farm. We want to wish you a happy Easter, and as you get together this holiday weekend, we hope you enjoy dyeing, decorating and eating eggs with your family! 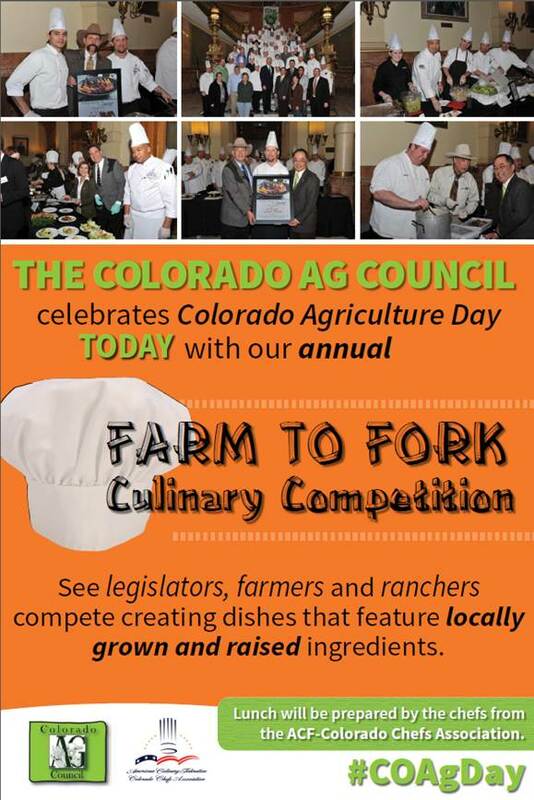 Today is Colorado Agriculture Day! YES! We filled the truck and will be donating a truckload of eggs to the Iowa Food Bank Association! 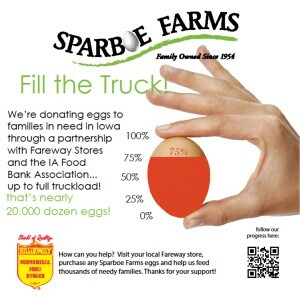 As a thank you for helping us with this great cause, Fareway is featuring Sparboe Farms large 18 ct eggs at $1.49! What a deal! Tune into the Lifetime Network tomorrow for a segment on everything eggs! Do you have the Lifetime Network? Tune in tomorrow (Tuesday) to Lifetime’s The Balancing Act. 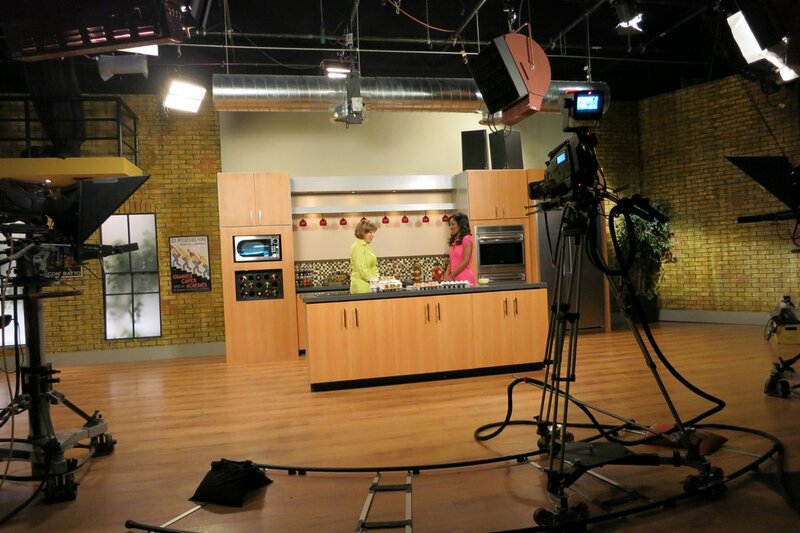 Our President Beth Schnell will be on talking everything eggs! The show airs at 6 am CST. If you go to our homepage, you can see a teaser for the segment! We are excited to announce that we are 75% of the way to filling the truck! 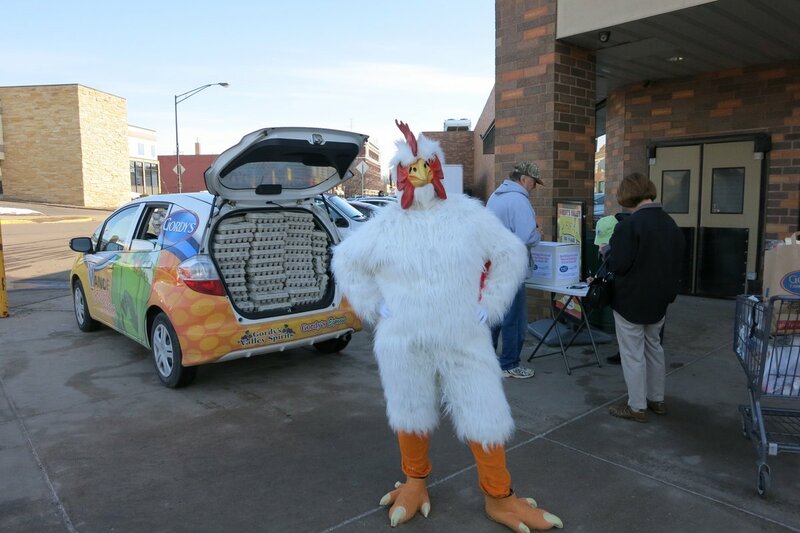 As a reminder, this campaign is with our customer, Fareway, and together we are donating a truckload of eggs to the Iowa Food Bank Association to feed families in need. The campaign has been mentioned in TV, radio and print media outlets and was even mentioned in our industry publication put out by CEAM and The Shelby Report, which is a grocery industry publication. If you live near a Fareway, help us get that last 25% and purchase a dozen eggs so that we can make this important donation to the community in Iowa. “Fill the Truck” campaign kicks off today! 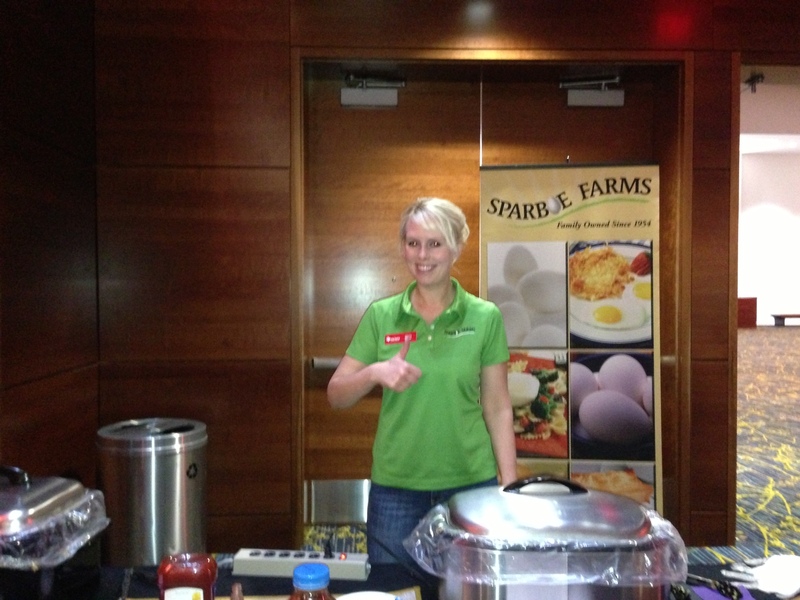 SPARBOE FARMS PARTNERS WITH FAREWAY STORES TO FILL THE TRUCK! 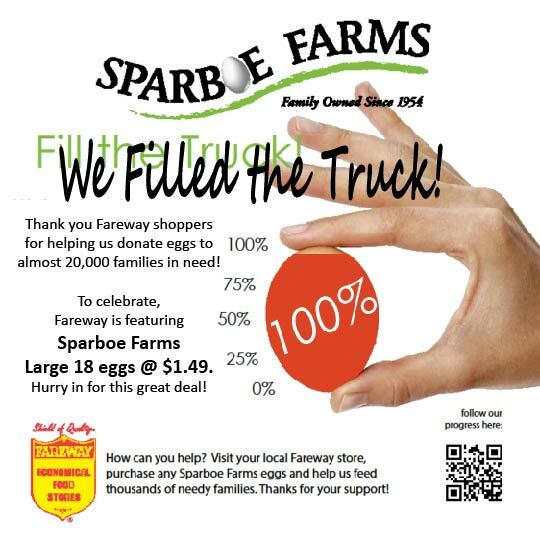 Sparboe Farms is honored to partner with Fareway Stores on a donation initiative providing eggs to families in need. Des Moines, Iowa January 7, 2013 – Beginning on January 8, 2013, with any size carton of Sparboe Farms eggs purchased at any Fareway store, Sparboe Farms will donate eggs through the Iowa Food Bank Association, which supports many of the communities where Fareway has stores. The goal is to fill an entire semi-truck with eggs – that is nearly 20,000 dozen eggs! Many local families are unable to feed their families fresh food, especially in the winter months. Fresh eggs are the perfect protein, providing healthy nutrition and, with a low glycemic index, they help you feel fuller longer. 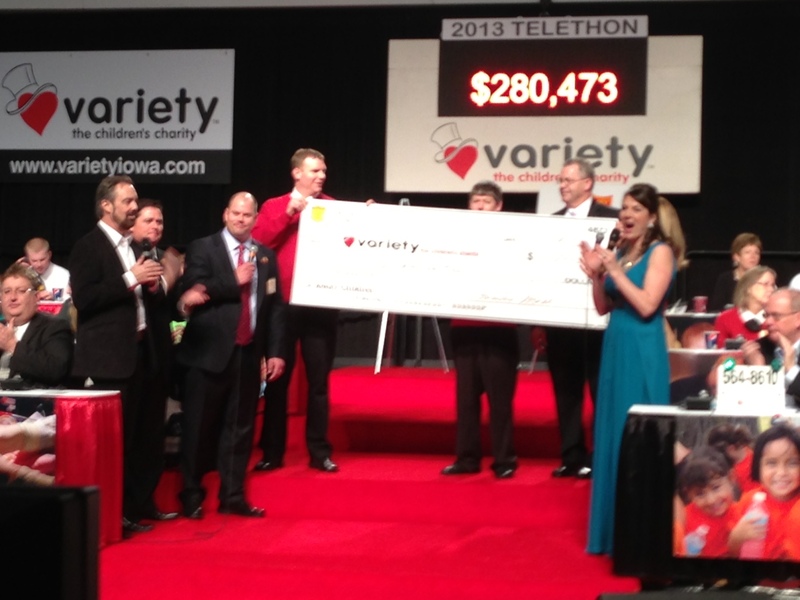 Giving back to the community is a core value for both Sparboe Farms and Fareway Stores. They are excited to work together to feed so many families. About Sparboe Farms: Sparboe Farms is a family-owned Midwestern company that has been producing fresh shell eggs and egg products since 1954. With farms in Iowa, Minnesota and Colorado we are proud to provide nutritious, wholesome and affordable eggs to feed America’s families. 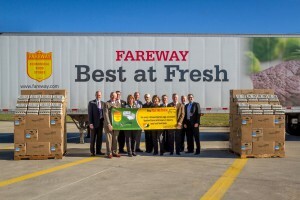 Find more information at www.sparboe.com, www.fareway.com, www.iowafba.org or on these company’s respective Facebook pages.